Home > Headlines > News > The 2018 VW Tiguan Is Coming to Canada! The 2018 VW Tiguan Is Coming to Canada! For those who love the comfort, practicality and spaciousness of an SUV, good news is right around the corner. Set to arrive in Canada in early 2017, the all-new second-generation 2018 VW Tiguan brings with it an elevated sense of performance and driving capabilities. The new Tiguan, renowned for its high-quality German engineering, has been redesigned to mimic the platform of the latest Golf and will be available in two sizes, which include a regular and a long-base wheel version. Compared to the previous models that came before it, the 2018 Tiguan features an even larger cargo space with a wider overall volume, but still remains compact and versatile for all of your driving needs. With an additional 145 litres of cargo, the 2018 Tiguan is the perfect family SUV in a sleek, redefined body that gives the word “crossover” a whole new meaning. Originally debuting in Frankfurt, Germany at the 2015 Auto Show, Canadians can expect the long-wheelbase Tiguan to saturate the North American market, based on former consumer behaviours and buying patterns. This model in particular is slightly more compact than the regular wheelbase version and presents the opportunity to hold seven passengers, reflecting its ability to accommodate different lifestyles in a five-passenger model. Its wheelbase is also 110 mm longer than its counterpart, which translates to additional interior and cargo space for passengers to enjoy, especially for those who have long suffered the cramped legs that tend to come standard with long car trips. The 2018 Tiguan will be available with a selection of eight different engines worldwide, representing four diesel and four gasoline. The turbocharged 2.0-litre four-cylinder gas engine, packed with improved power and fuel consumption technologies is the best bet for the Canadian market. The new Tiguan is distinctively lighter in weight, but still provides an exceptional performance out on the road, be it on the highway, the suburbs, or an old country road. For those who seek the thrill of a rugged off-road experience, the Tiguan has you covered. With built in driving alerts and automated controls, the Tiguan can handle even the most aggressive styles of driving at the slightest touch of the wheel. Volkswagen enthusiasts can expect to be nothing short of amazed when it comes to the interior of the 2018 Tiguan. Packed with even more intelligent technologies like flatscreen entertainment systems, stunning surround-sound audio and a TFT instrument panel, drivers and passengers alike will enjoy a ride like never before. The 2018 Tiguan also features a predictive system which allows the vehicle to shift its gears and tires to accommodate challenging road conditions like steep hills, bumpy routes, ice and snow. The new Tiguan is bigger, more powerful and better than ever. Prices will be announced closer to the release date, but drivers who are eager to get behind the wheel of a 2018 Tiguan should expect a price that is comparable with other recent models. 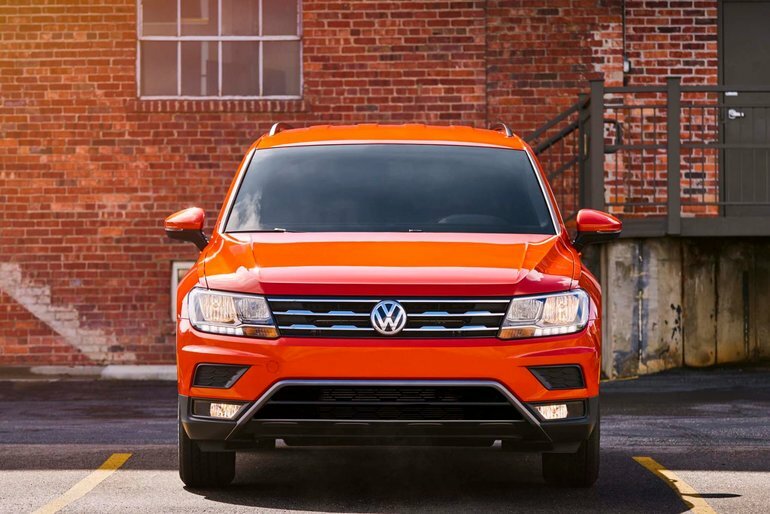 Stay tuned for more news on the stunning new 2018 Volkswagen Tiguan, and don’t forget to check back with us here at Crosby Volkswagen to learn more! Contact us today at (519) 894-9300 to speak with one of our sales professionals.